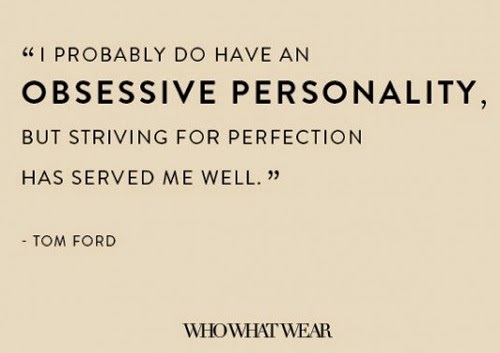 The talented designer and self-proclaimed perfectionist Tom Ford has said many memorable things about life and fashion over the years. His best quotes here. And while we´re at the subject of perfectionism, which many of us have an unhealthy relationship to (or at least some kind of hate/love relationship with); a well-known British boarding school recently launched a project for all its teenage girls called "The death of little miss perfect" (which in turn just happen to be the perrrfect name for that). That must be one insightful, pioneering headmistress not wasting a day to give young girls better views on life, cheers to that! I wish my girls could understand this and not be affected so much by striving for perfection! However, I know I was and am still guilty of it myself! Have a great end of Summer weekend! I remember reading about this. A great idea and hopefully these girls will take on board what they have learnt. It's true that we are surrounded by images which promote perfection.